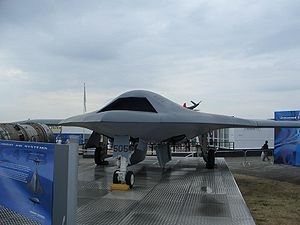 The US Navy did not commit to practical UCAV efforts until mid-2000, when the service awarded contracts of US$2 million each to Boeing and Northrop Grumman for a 15-month concept-exploration program. Design considerations for a naval UCAV included dealing with the corrosive salt-water environment, deck handling for launch and recovery, integration with command and control systems, and operation in a carrier's high electromagnetic interference environment. The Navy was also interested in using their UCAVs for reconnaissance missions, penetrating protected airspace to identify targets for the attack waves. The J-UCAS program was terminated in February 2006 following the US military's Quadrennial Defense Review. The US Air Force and US Navy proceeded with their own UAV programs. The Navy selected Northrop Grumman's X-47B as its unmanned combat air system demonstrator (UCAS-D) program. Roll out of the X-47B was at Air Force Plant 42 in Palmdale, California on December 16, 2008. First flight was expected to occur in November 2009, but was delayed until the first quarter of 2010 due to "propulsion acoustic and engine-start sequencing issues". The X-47B carries no weapons, but has a full-sized weapons bay. In order to provide realistic testing, the demonstration vehicle is the same size and weight as the projected operational craft. On December 29, 2009 Northrop Grumman oversaw towed taxi tests of the aircraft at the Palmdale facility, and are expected to taxi the craft under its own power in January 2010. It is planned to have a three year test program at Edwards AFB, California and NAS Patuxent River, Maryland, culminating in sea trials in 2013. First flight of X-47B Air Vehicle 1 (AV-1) occurred at Edwards AFB on 4 February 2011. X-47A X-47B X-47C Proposed larger version with a payload of 10,000 lb (4,500 kg) and a wingspan of 172 ft (52.4 m). Northrop Grumman X-47B Pictures and Northrop Grumman X-47B for Sale.